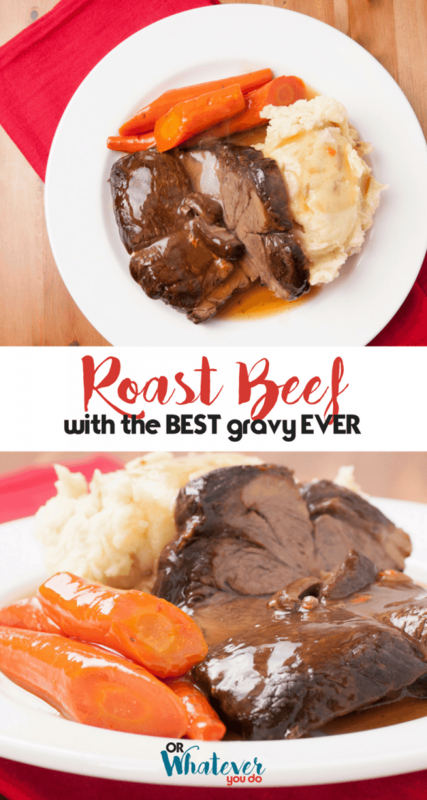 Roast Beef Dinner is a classic that I remember from my childhood. 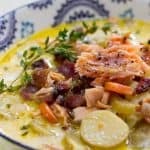 It is a real meat and potatoes meal that is pure comfort food. 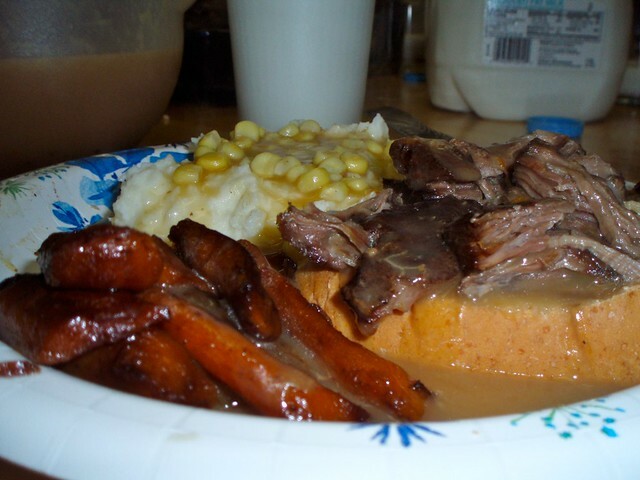 Roast beef, or rather hot roast beef with mashed potatoes, gravy, corn, carrots, and really good crusty bread – is my all-time favorite meal, ever. Ever ever. 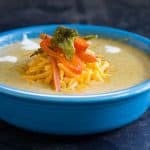 You might hear me say that a lot because I have a lot of favorite meals, but this is one that is constantly bouncing between turkey dinner, spaghetti, and pizza. All four trade places depending on what one I’m eating that second, and how good that one turned out. So here it is. My super-not-secret-or-very-complicated recipe for a roast beef dinner, with all of the fixings. First, buy a roast, anywhere from 2-4 pounds is good. 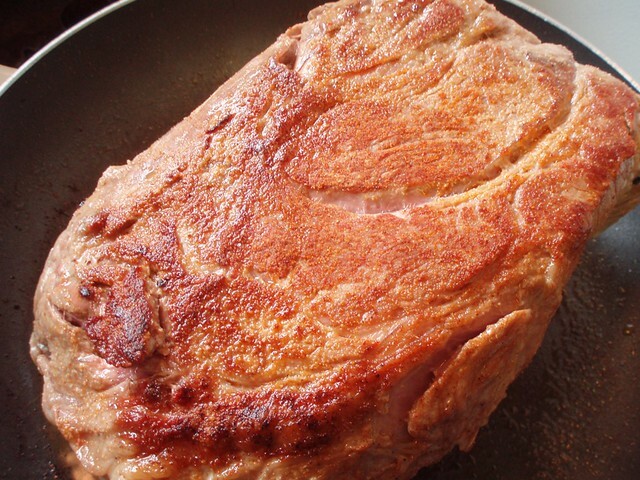 You want a shoulder chuck roast with lots of marbling, but not many huge veins of fat visible. If in doubt, have the butcher help you pick out a good one. It’s all about the cut, so they tell me. 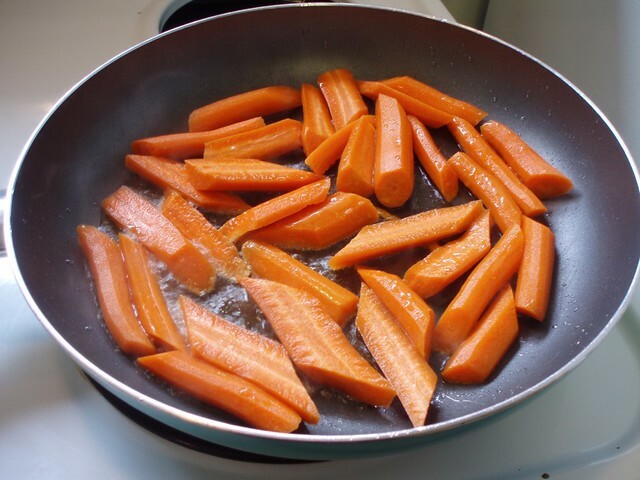 Next, peel your carrots, cut off the ends, cut them diagonally, and the thicker ones in half vertically as well. You are aiming for lots of surface area to brown. Toss them into a heated frying pan with a few tablespoons of oil in it. Canola or vegetable is great for this. Let these cook for a while before stirring them at all. You want color. Nice brown color, on as many sides as possible. Make sure you don’t get black though. Black is not good. When the carrots are almost done browning, toss the onion in and brown it on the three cut sides. Remove all of that from the pan and set it aside. 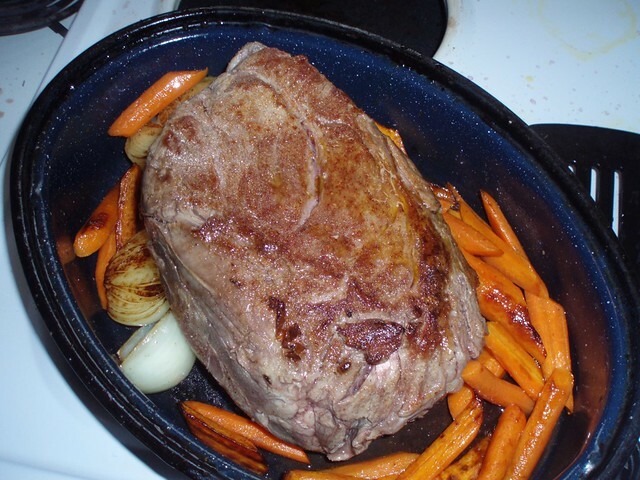 Put the seasoned, thawed roast in the pan and don’t touch it for 2-3 minutes. You want color, again, nice brown, lovely color. Flip it over and brown the other side as well. 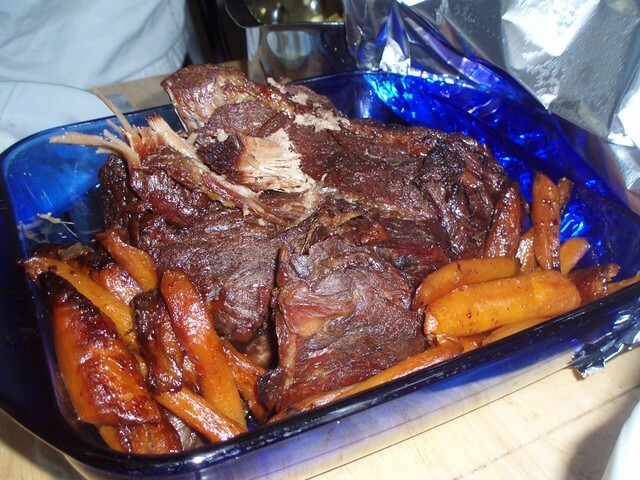 After the roast is browned take about 1/2 – 1 cup of red wine and pour into the pan. Let that simmer a minute or two and then carefully move roast and all juices/wine into a roasting pan. Put the cover on, and stick the roaster in a 300 degree oven. Forget about it for at least 3 hours. Do not peek. Do not open the oven, and especially do not open the cover of the roaster. So you’ve left your roast in the oven now for three full hours on 300, and haven’t peeked, right? If you’ve done everything right, here is what you should be staring at when you finally DO get to take a peek. What you see there is several inches of beefy, fatty, dark, rich, FLAVOR. That’s the base for our gravy. Take a turkey baster and take out the majority of that delicious nectar, and stick it in the fridge. Do you see the fat on the top, floating up already? That fat, very soon, is going to be the roux for our gravy. I have made a LOT of gravy in my years, but none better than when I discovered doing the majority of the roux in the beef fat. Take out a couple of cups, at least, to set aside. If you don’t do this, sometimes the yummy goodness can cook into the meat and veggies, and evaporate, or something, but the longer you cook it the less there is and I love this stuff. I’m not sure how technically sound this particular step is, but it’s what I do and it works, so why not? In another one and a half to two hours, here is what will be staring you in the face begging you to eat it. I didn’t quite get to it in time to take the pictures before my starving boy children and equally starving husband dug in, right after making fun of me for scrambling for my camera. I think he had a hard time keeping a straight face as I was telling him food blogging is ALL about the pictures. He is not a blogger, or a fan of bloggers. I’m not even sure if he knows exactly what the blogging is all about. My plate. Thank you Jesus for food, and good food, and the ability to cook and eat said good food. Oh, now back to that gravy. During the gravy portion things were a little crazy. Jeremiah was mashing potatoes. Kids were clanging silverware on the table. Babies were running around screeching. I didn’t get any pictures of the actual process, so I will do my best to describe it to you. 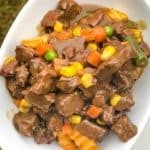 Take your refrigerated beef stock out of the fridge (WHY does fridge have a ‘d’, but refrigerated does not??? Am I crazy? Did my spellchecker fail me??). Scrape off the layer of fat that has semi-hardened and put it in a small, itty, bitty, fry pan. I use a little tiny cast iron skillet. It’s about 4″ across I think. If I didn’t have this to use I’d probably use my smallest saucepan. Take your roast out of the oven also and get all of the fat you can out of the bottom of your roaster. I had all fat at the bottom of mine, so I just got out the turkey baster again and took it out. If you have liquid still, it will be harder, but the labor of love is worth it. Warning though…make SURE you are only getting fat. This roux will not work if it’s contaminated with regular liquid. Take all that fat, (I ended up with about 1/4 cup? Maybe a little less?) 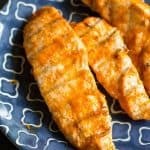 put it in your itty-bitty-teeny-tiny cast-iron skillet, heat on medium, and stir in with a fork several TBSP of flour. Stir in as much as you can before it gets paste-like. You don’t want it too thick. If you go a little overboard, you can thin it down again with a bit of butter. Cook this, stirring constantly, for about 5 minutes. 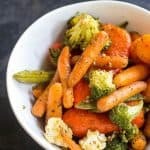 You’ve since removed your roast from the pan along with the carrots and onions and have covered it with foil to keep it warm. 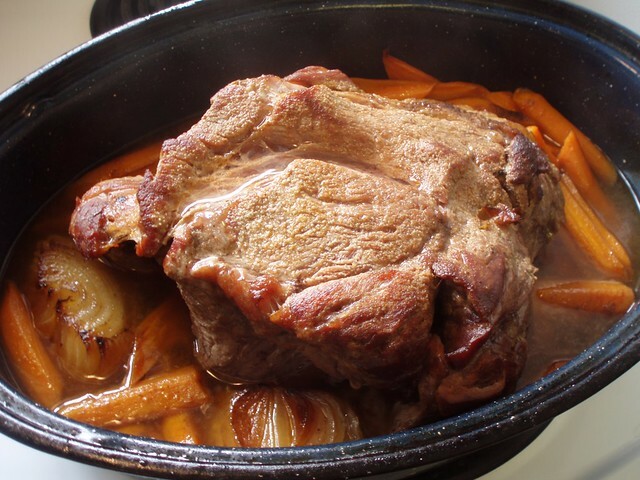 Put the roaster on the stove, and dump the beef stock that you reserved earlier in, as well as several cups of potato water (the water left from boiling the mashed potatoes. Best stuff EVAH for gravy making.). I also toss in a few tsp of Better Than Bouillon Beef Base if I think it needs it. Bring this all up to a boil, and whisk it frequently making sure to loosen any stuck on bits from the bottom of the pan. While whisking, SLOWLY drizzle (or glop, depending on the consistency of your roux) the roux into the gravy. Bring to a boil and cook for 2 minutes. 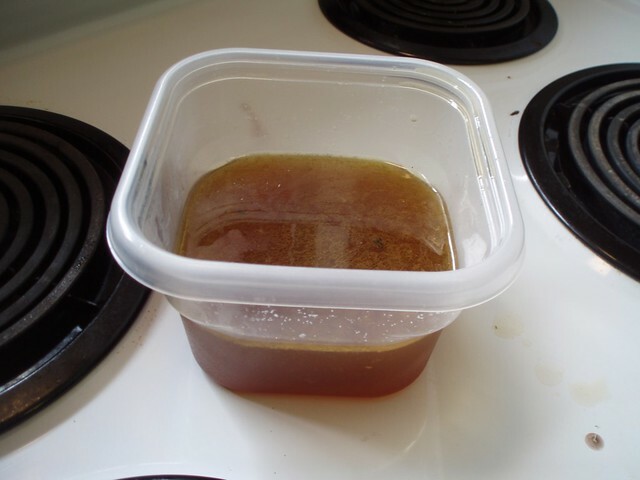 If gravy needs to be thicker, mix a few more TBSP of flour with COLD water until there are no more lumps and slowly drizzle into the boiling gravy while whisking. Whether or not you will need extra thickening depends on a couple of different factors. How much gravy you are making. Play it by ear, or eye, rather, and salt the gravy to taste. We made mashed potatoes with this as well. Good stuff. Homemade roast beef dinner! This makes the BEST roast, ever. 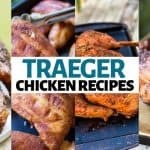 Super traditional, super easy, You need this in your winter recipe rotation! Place a couple tablespoons in a large frying pan, preferably cast iron, and heat over medium high heat. 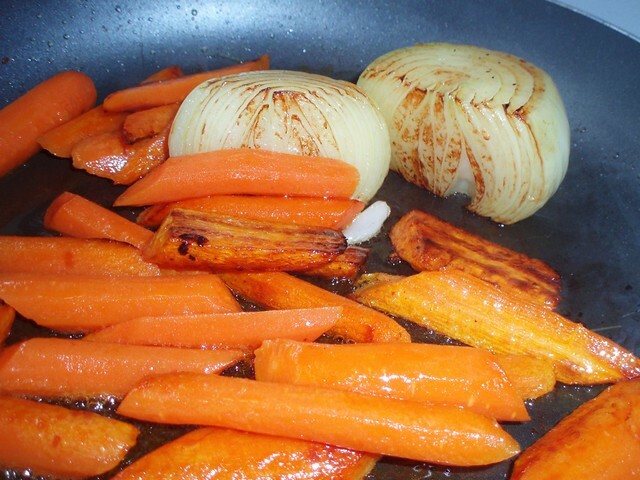 Place carrots and onion into the pan and brown lightly on all sides. Remove from pan and set aside. Add another couple tablespoons oil, and allow to pan to heat up again. Season roast liberally with the seasoning salt, garlic salt, and pepper. Place into the preheated pan, and brown well on both sides. 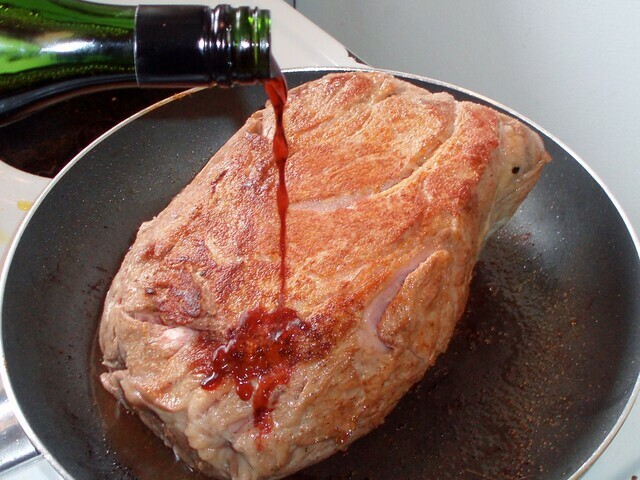 Add 1 cup of dry red wine to the pan. Deglaze the pan and get all of the bits off the bottom, and then put the roast, pan juices, carrots, and onion into a roasting pan. Cover and place into the oven and cook for 3 hours. After 3 hours, take a peek. 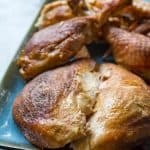 Remove 1-2 cups of the liquid from the pan and place into the fridge, recover and put back into the oven for an additional hour or two, or until the roast is fork tender. When the roast is done, pull out the rest of the pan juices. It may be just fat at this point. That's okay. 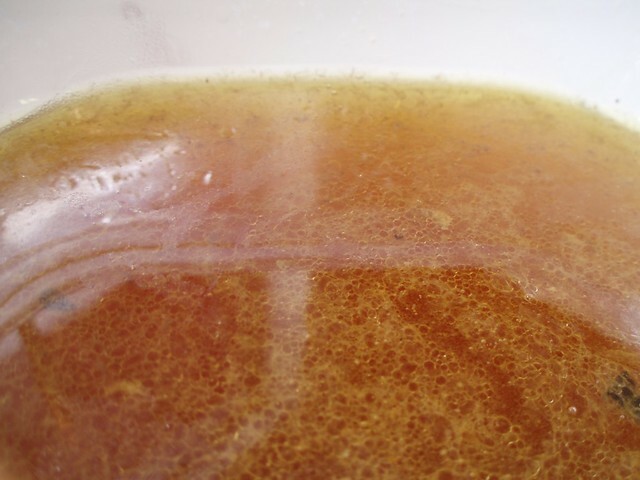 Scrape the fat off the top of your refrigerated pan juices, put them with the remaining fat from the pan (make sure it is just fat though! ), and place into a small saute pan. Heat over medium to medium low heat, and whisk in an equal amount of flour. Cook, stirring constantly, for about 2-3 minutes. Place the rest of the liquid pan drippings into a sauce pan and bring to a boil. Extend for a bit with beef broth if there isn't enough. Whisk in the roux and simmer until thickened. You may need to add a little additional flour/water roux to get to the thickness you prefer. 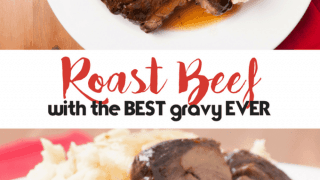 Gravy isn't an exact science, so don't be afraid to play around a bit to get it right where you want it. 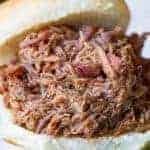 Need more ideas for chuck roast? I’ve got lots more where this came from!